Preparing a home for sale can be a difficult task, even if a home is vacant. Sometimes a vacant home does not "show" very well. These photos are courtesy of Kelly Austin, of Houston Home Tending. 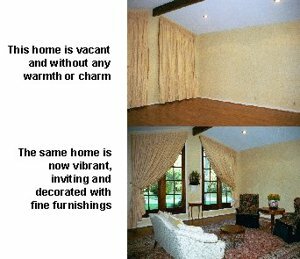 Which room looks warmer and more inviting to you? If you chose the bottom picture, you are not alone – most home buyers agree with you. The Real Estate Staging Association reports that furnished, decorated, and occupied homes spend up to 78% less time on the market compared to vacant homes. In addition, an occupied home may be less prone to vandalism and can be cheaper to insure. Amazingly, the home tending service that yields these benefits is free to the home owner. Move out promptly (usually within 21 days) when a contract is accepted. When choosing a home tending service, be certain that the company is properly bonded. The company management must respond promptly and professionally to questions from both the home owner and the Realtor. And one last helpful hint – ask your potential home tending service how often they “spot check” the properties in their care. I personally find that frequent, unannounced visits keep every home in top condition! So when preparing a home for sale, consider a home tender if your home is vacant. How Do I Set My Asking Price? At Roger Martin Properties, our mission is to give our clients Unmatched Personal Attention during the buying and selling of their homes.